Are You Looking for a Way to Bring Natural Light into Your Kitchen? We all want more natural light in our homes, especially in the kitchen where we spend so much time. Natural light can help us improve our moods and energy levels, and make our kitchens look brighter and more spacious. If you want to flood your kitchen with natural light, these 8 tips are a great place to start. Purchase a soft shade of white or off-white cabinets in a satin finish. Shades of white will make a space feel brighter because it will reflect the natural light entering the room, rather than absorbing it. The crisp, white finish of your kitchen cabinets will also make the room look bigger and cleaner. 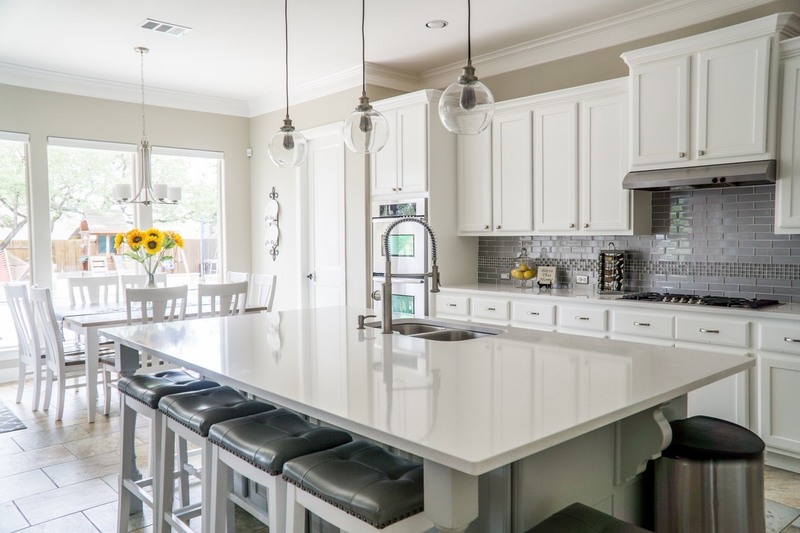 Since the majority of families spend most of their time in the kitchen, updated white cabinetry will add the perfect amount of natural brightness to the space. Consider using shiny and light reflective finishes like chrome or classic white for kitchen appliances, fixtures, and hardware. Granite, marble, or quartz countertops will add another light-reflective surface in your kitchen. Kitchen floors can also be transformed into natural light amplifiers if you opt for wooden, ceramic, or stone floors with a shiny, polished finish. Perhaps the most obvious way to bring more natural light into the kitchen is to add a skylight. Skylights are effective because as the sun moves throughout the day, the light will reflect in different areas of your kitchen creating movement and visual interest. True, skylights tend to be pricey but remember, a skylight can boost your home’s value if you ever decide to put it on the market. Again, this is pretty obvious, but if you want more natural light in the kitchen then installing larger windows is a great option. For ultimate light levels in the kitchen consider installing a bi-fold door, which will transform an entire wall of your kitchen into glass. Give the trees a trim. Look at the greenery that’s outside your home. Determine if there are any bushes, trees, or plants that are blocking light from entering your kitchen. If so, then give them a trim or hire a professional to take care of branches on tall trees. That alone can make a big difference. While you’re outside looking at the landscaping, take a few minutes to give your kitchen windows a good wash. You’d be surprised at how much more natural light will enter your kitchen just by having clean windows. This is probably the easiest and cheapest tip on the list, so try this one ASAP. Boost brightness in your kitchen with strategic use of artificial light sources that will enhance, rather than take over, any natural light coming into the room. Pay particular attention to areas where light from the windows doesn’t reach such as corners, corridors, or alcoves. Under-cabinet lighting is a particularly good option for bringing more brightness into a room. When picking out window treatments for the kitchen, stay away from room-darkening shades, blinds or heavy curtains. Instead, opt for more translucent treatments and sheer curtains that allow natural light to filter in while still providing privacy. Getting more natural light in the kitchen isn’t hard. Any of the tips above will help you light up your life a bit more. If you’re looking for new cabinets to help brighten up your kitchen, then contact Special Additions. We’re one of the largest and most reputable cabinetry dealers in the New Jersey/New York Area. We’ve been family owned and operated since we opened our doors in 1978.